aslinda daha once "yemelik takilar" adi altinda sunmus oldugum gibi bahsedectim bundan ve bundan hemen sonra bahsedecek olduklarimdan ama, dusununce teker teker bahsetmenin daha iyi olacakmis gibi geldi. 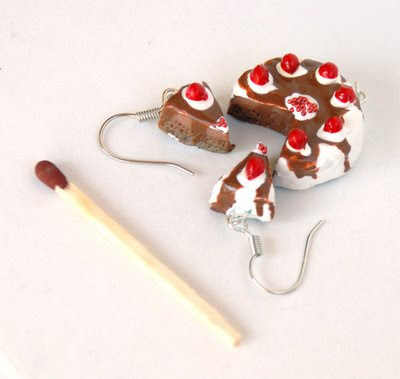 bir de aslinda fotograf cekme tembelligim olmasa birikmeyecek bu kadar, gunu gunune calismak oyle bir sey tabi ama, napalim artik..
at first i was going to talk about these like i did on a previous post called "eatable accessories", but then i realiZed this way would be better. as a matter of fact, they wouldn't pile like this if i can manage to phoghraph them daily but.. anyway..
bu arkadasi aslinda tee cek cumhuriyeti'ndeyken yapmistim ama iste, firsat olmadi bir turlu fotograflamaya.. kendileri yine bir oncekiler gibi, polimer kil, akrilik boya ve kisnis tohumundan mutesekkil bir taki seti. iki dilim kupe, pastanin kalani kolye ucu seklinde. pastanin da alti cikolatali kek, ustu cikolatali krema gibi bir seyden olusuyor. en ustte de krema ve cikolatali sos var. this one was actually made a long long time ago, in cZech republic but i just couldn't find the time to photograph it.. it's made of polymer clay, acrylics and spice seeds like the ones before. 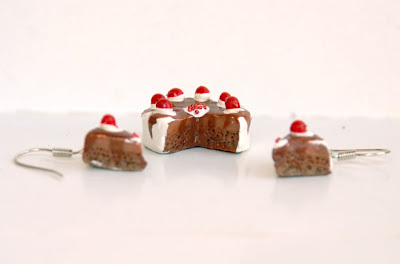 two slices of earrings, and the remaining cake as the pendant. the cake has two layers; bottom layer is a spongy chocolate cake and the top layer is a more creamy chocolate mixture. 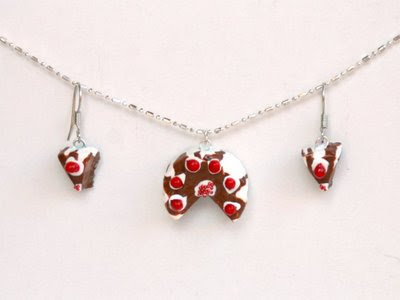 on top of everything is the frosting and chocolate sauce. velhasil, esty icin burada, pasaj icin de burada beklemekteler..
anyhow, it's waiting here on etsy, and here on pasaj.